It's our model for moving organizations in the right direction. eC²® maps a course for organizations to dramatically improve profitability, efficiency, and service culture. Every connection counts. In many ways, staff members are your toughest customers. Rallying them around the organization's mission and empowering them to deliver an exceptional customer experience requires planning and commitment. Our eC²® model places the employee at the center of customer experience improvement. By engaging, empowering and supporting staff, we help organizations create service cultures in which loyalty, trust, personal ownership and professional development ultimately drive the customer experience. Simply: satisfied employees lead to satisfied customers. Most companies can identify their values, the beliefs and philosophies that guide the way they do business. But surprisingly few have developed service values—the purpose, the standards and the behaviors that influence the way an organization defines, delivers and manages the customer experience. These principles are essential for providing consistency across all departments and clear direction for all staff. Shaping a thriving service culture will create loyal employees, delight customers and deliver a differentiated experience that improves all areas of your organization—especially profits. Our approach helps companies deliver memorable customer and employee experiences by encouraging company leaders to be engaged participants in the process. This includes establishing standards of accountability, setting expectations, modeling practices and emphasizing the organization's service principles. If a company's efforts to improve the customer experience have any chance of long-term success, they must be accompanied by a sound communications plan to bring staff into the loop. CSE uses available communication vehicles (such as newsletters, intranets and company meetings) to launch a communication campaign that's consistent, timely and relevant to stakeholders throughout the organization. CSE also understands the value of effective interpersonal communication and uses the principles of DiSC® to help people identify and use their behavioral style to help benefit the organization. Successful companies have workforces that understand and embrace the service principles of the organization and the impact every individual has on the customer experience. Our approach recognizes that training isn't a magic bullet and professional development doesn't happen in a vacuum. We've helped clients realize their greatest successes by integrating learning into a larger service culture effort—one that factors in information and feedback from employees and customers, lobbies for leader involvement and examines organizational processes. While other companies simply sell training, we look for ways to make learning an innate part of an organization's overall customer experience strategy. We start by assessing the employee experience. By measuring staff perceptions towards the organization, we can identify the barriers that many organizations unwittingly place in front of staff—and help clients to modify, recreate or overcome them. Ultimately we recommend client companies implement processes that support a culture of service for employees and customers. 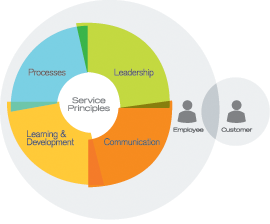 A healthy service culture is essential to any organization's success. When all of the connections of the eC²® approach work together, organizations can create a positive, engaging employee experience that produces outstanding customer experiences. Learn more about how eC2® can help unlock the code to delightful customer experiences in YOUR organization!